It was too expensive. I wouldn't go through Viator again as I don't believe we received the value for the tour. Our guide was quite nice, however. And the people handling things 'on the ground' were very responsive when they realized no tickets were available to enter the Basilica. Our guide was very nice, knowledgable and helpful. The overall experience was very good. Definitely recommend! Very nice and knowledgeable. Thank you. Absolutely excellent tour! Marcel was so charming and knowledgeable. The correspondence with the office beforehand was great - they even sent me a photo of Marcel so I could recognise him. We were taken via subway to the Sagrada and given a brilliant tour, full of information. Highly recommended! Jordi was an excellent guide, funny and knowledgeable. He not only provided great history about the Sagrada Familia, but also knew the best spots to take photos! 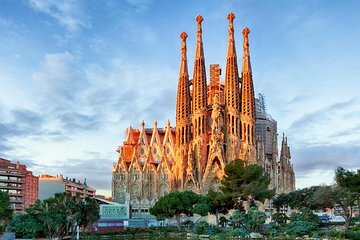 The Sagrada is one not to miss. Truly a amazing site to visit. History still in the making. Jacob met us at the Sagrada Familia and turned what could have been a long two hours into a truly fascinating experience. Jacob's knowledge of the building, it's history, Gaudi as an artisit and as a man, and Barcelona itself was excellent. He made a wonderful impression on my husband and i. We didn't want to go on a group tour. This personalized experience was perfect for us and Jacob covered everything in detail. Best decision we ever made to book a private tour of Sagrada Familia. Jordi was quite knowledgeable and helpful. He even taught us how to use the Metro. Well done!! Great Tour. Beautiful. Will definitely come again.